Office of the Commissioner of Customs Issued a Advertisement For Recruiting 20 Group C .All Eligible And Willing Candidates Can Check Detailed Advertisement From Their Official Website & Apply Offline Before 14-07-2017.Eligible And Interested Candidates Can Check Detailed Information For Each Postion Such As - Eligibility Criteria, Qualifications, Age Limit, Selection Procedure Before Applying. 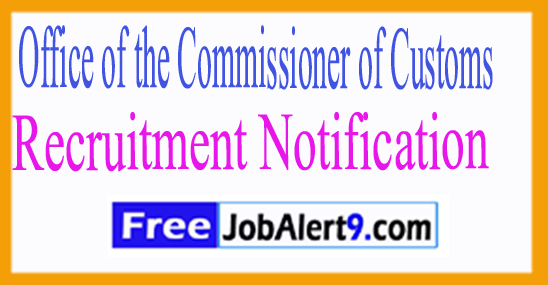 Office of the Commissioner of Customs Recruitment 2017. Candidates Maximum Age should be Between 18 to 30 Years (Post 1-3), 18 to 25 Years. Salary And Grade Pay Scale: INR Rs. 5200 - 20200/- With 1800/2400/- Grade Pay. Candidates Can Download Application Form through official website (http://www.vijaywadacustoms.gov.in). After Filling The application form, Candidate must send hard by copies of Application along with relevant Testimonials Mentioned In Detailed Advertisement to the following Address before/ (14-07-2017). The Commissioner Customs Preventive Commissionerate, Auto Nagar, Vijaywada, 55-17-3, C-14 2nd floor, Industrial State Autonagar Vijaywada-520007 . Important Dates :Last Date for Receiving of Offline Application Form Is: 14-07-2017 .